A Curated Sakura Experience in the Garden is one of two events hosted by Tealeaves in partnership with UBC Botanical Garden. 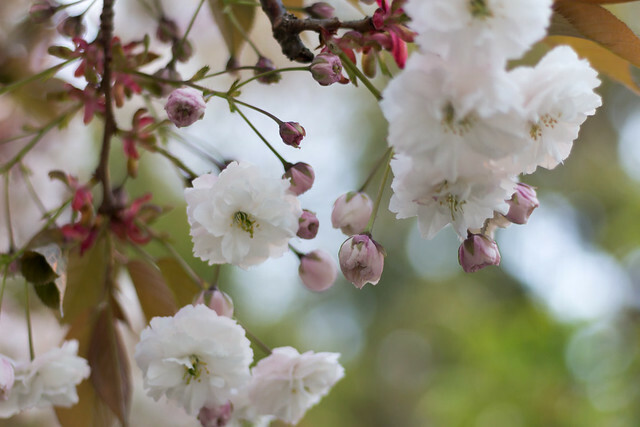 Hosted at Nitobe Memorial Garden, A Curated Sakura Experience in the Garden explores the beauty of cherry blossoms through Japanese aesthetics and philosophical discussions on complexity and transience. The night also introduced Tealeaves’ Cherry Blossom Green, an aptly limited-edition accord of springtime aromas. Associate Director, Horticulture & Collections, Douglas Justice, opened the night with a tour of Nitobe Memorial Garden’s sakura collection. The centuries old Japanese tradition of hanami has served as a celebration and appreciation of the transient beauty of flowers, most often the sakura, or cherry blossom. The cherry tree in its seasonal cycle represents the circle of life – from flower to fruition to the falling of leaves. In a single visit, one can observe an array of cherry species in their varying seasonal cycles. Throughout the night, hosts from Urasenke Foundation performed chado (the way of tea), otherwise known as Japanese tea ceremony in the Nitobe Garden tea house, Ichibō-an (Hut of the Sweeping View). The tea is prepared in a separate room where hosts whisk the matcha with a bamboo whisk (chasen). Japanese ceramicist HiDe Ebina described the firing of his ceramic works as an effort to capture the complexity in fleeting beauty. He explains our observations of nature’s subtlety as a function of survival and sustenance – a philosophy deeply rooted within us. Our fast-paced and occasionally disengaged modern lives are a departure from our natural instinct Ebina points out. While the cherry trees at Nitobe Memorial Garden are no longer in their blooming period, we are reminded of mono no aware – the pathos of things – and the evanescence of the cherry blossom. Douglas describes the various qualities of Nitobe Garden’s cherry blossoms in April in the Garden 2018.